The scientific analysis of astronomical spectra began with a paper William Hyde Wollaston in the Philosophical Transactions of the Royal Society Vol. 102, p. 378, 1802. He was the first person to notice the presence of dark bands in the optical spectrum of the Sun. These bands were subsequently analysed in great detail by Joseph von Fraunhofer in a paper published in 1814 and are now usually known as Fraunhofer lines. Technical difficulties made it impossible to obtain spectra of stars other than the Sun for a considerable time, but William Huggins finally succeeded in 1864. 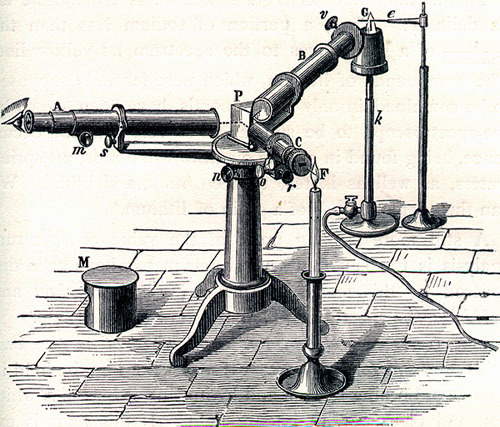 A drawing of his pioneering spectroscope is shown below. Meanwhile, fundamental work by Gustav Kirchoff and Robert Bunsen had been helping to establish an understanding the spectra produced by hot gases. The identification of features in the Sun’s spectrum with similar lines produced in laboratory experiments led to a breakthrough in our understanding of the Universe whose importance shouldn’t be underestimated. The Sun and stars were inaccessible to direct experimental test during the 19th Century (as they are now). But spectroscopy now made it possible to gather evidence about their chemical composition as well as physical properties. Most importantly, spectroscopy provided definitive evidence that the Sun wasn’t made of some kind of exotic unknowable celestial material, but of the same kind of stuff (mainly Hydrogen) that could be studied on Earth. This realization opened the possibility of applying the physical understanding gained from small-scale experiments to the largest scale phenomena that could be seen. The science of astrophysics was born. One of the leading journals in which professional astronomers and astrophysicists publish their research is called the Astrophysical Journal, which was founded in 1895 and is still going strong. The central importance of the (still) young field of spectroscopy can be appreciated from the subtitle given to the journal: Initially the branch of physics most important to astrophysics was atomic physics since the lines in optical spectra are produced by electrons jumping between different atomic energy levels. Spectroscopy of course remains a key weapon in the astrophysicist’s arsenal but nowadays the term is taken to mean any application of physical laws to astronomical objects. Over the years, astrophysics has gradually incorporated nuclear and particle physics as well as thermodynamics, relativity and just about every other branch of physics you can think of. I realise, however, that this isn’t really the answer to the question that potential students want to ask. What they (probably) want to know is what is the difference between undergraduate courses called Astronomy and those called Astrophysics? The answer to this one depends very much on where you want to study. Generally speaking the differences are in fact quite minimal. You probably do a bit more theory in an Astrophysics course than an Astronomy course, for example. Your final-year project might have to be observational or instrumental if you do Astronomy, but might be theoretical in Astrophysics. If you compare the complete list of modules to be taken, however, the difference will be very small. Over the last twenty years or so, most Physics departments in the United Kingdom have acquired some form of research group in astronomy or astrophysics and have started to offer undergraduate degrees with some astronomical or astrophysical content. My only advice to prospective students wanting to find which course is for them is to look at the list of modules and projects likely to be offered. You’re unlikely to find the name of the course itself to be very helpful in making a choice. One of the things that drew me into astrophysics as a discipline (my current position is Professor of Theoretical Astrophysics) is that it involves such a wide range of techniques and applications, putting apparently esoteric things together in interesting ways to develop a theoretical understanding of a complicated phenomenon. I only had a very limited opportunity to study astrophysics during my first degree as I specialised in Theoretical Physics. This wasn’t just a feature of Cambridge. The attitude in most Universities in those days was that you had to learn all the physics before applying it to astronomy. Over the years this has changed, and most departments offer some astronomy right from Year 1. I think this change has been for the better because I think the astronomical setting provides a very exciting context to learn physics. If you want to understand, say, the structure of the Sun you have to include atomic physics, nuclear physics, gravity, thermodynamics, radiative transfer and hydrostatics all at the same time. This sort of thing makes astrophysics a good subject for developing synthetic skills while more traditional physics teaching focusses almost exclusively on analytical skills. Indeed, my first-year Astrophysical Concepts course is really a course about modelling and problem-solving in physics. This entry was posted on July 25, 2009 at 1:13 pm and is filed under The Universe and Stuff with tags astronomy, Astrophysics, Joseph von Fraunhofer, spectroscopy, William Huggins, William Hyde Wollaston. You can follow any responses to this entry through the RSS 2.0 feed. You can leave a response, or trackback from your own site. Astronomers and astrophysicists both might like to read the editorial comment in this week’s Grauniad In Praise of..Astronomers. PhD Comics has a fairly accurate take on how I respond when asked. It’s also good to make sure you don’t tell someone you do astronomy if you think their response will be to ask you do read them their horoscope. 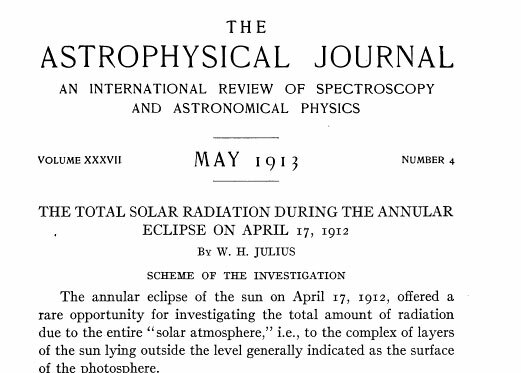 When George Ellery Hale co-founded the Astrophysical Journal in 1895 he named it such to distinguish it from the Astronomical Journal, aiming ApJ to feature papers primarily (exclusively?) concerned with “astrophysics” rather than traditional astronomy. Hale’s promotion of astro-physics was evident in his design of Yerkes observatory, and his development of the heliograph, allowing astronomers to take spectra of the entire disk of the sun. I have found that less of a distinction is made between astronomy and astrophysics in the UK than in the US. Indeed, the department in Chicago is called the Department of Astronomy & Astrophysics. Here in Cardiff we call ourselves the School of Physics and Astronomy, not Astrophysics….. Since I’ve interpreted Astrophysics as a subset of Astronomy it makes sense to use the more general term (Astronomy) in the School’s name. However, as I said in my reply to Bryn, I think both are really part of Physics so I wouldn’t mind if the School were simply called the School of Physics. Durham, for example, has a large number of astronomers and astrophysicists but still has a Physics Department. Gentlemen that reminds me of a bit of correspondence in – I think – Physics World about precisely this matter. My thesis supervisor joined in at one point with a letter that said he never knew the difference between astronomy and astrophysics but when he went to the States and they asked him at Customs what he did, if he said astronomer they always waved him through but if he said astrophysics they inevitably wanted to search his bags. The difference between astronomy and astrophysics is a long-running issue and there is, as you suggest, no definitive answer. I rather like your historical definition of astrophysics as a subdiscipline of astronomy mostly concerned with the physical characters of objects. I also quite like the Royal Astronomical Society’s definition: astronomy is divided into astrophysics and planetary science, the distinction being made on the techniques used. Astrophysics uses physics and mathematics, while planetary science is based primarily on the techniques of geophysics and geology. Historically, the term physical astronomy was used in the middle of the 19th century before the term astrophysics came into use. Related to your comment is another peculiarity of British astronomy, in that it has historically been associated with mathematics departments rather more frequently than with physics. As for the names of departments, I think I’d actually rather just stick with Physics. I’ve always regarded Astronomy, as a modern scientific discipline, as a subset of Physics. However, there are people – including a certain Professor of Astronomy I could name – who have gone on record as stating that Astronomy isn’t even Science, never mind Physics. I’ve always regarded astronomy as the study of the Universe and its constituents, while physics is the study of the natural laws that govern physical processes within the Universe. Therefore physics is a subdiscipline of astronomy. Yes, historically astronomy did take place within mathematics departments. Your Cardiff University astrophysics group can trace its origins to activities in the Department of Applied Mathematics and Astronomy of University College Cardiff (where Rhodri and I started our PhD studies). I used to use the following scheme: among astronomers, I was a cosmologist (otherwise people expect me to know about spectroscopy); among cosmologists, I was an astronomer (otherwise I might get confused with early-universe particle-physics types); among lay persons I was an astrophysicist (otherwise I would be asked about horoscopes); when wanting to borrow money from a bank I was a physicist. Yes, the reason for being an astronomer among cosmologists is deliberately capable of two interpretations. I too have found that telling a non-scientist that you are an astronomer often provokes a question about horoscopes; but saying that you are an astrophysicist often brings questions about Stephen Hawking or particle physics. And I’m not sure many astronomers know that much about spectroscopy anyway (not about atomic energy levels and line production processes). I feel the character talking about the anthropic principle in the PhD Comics edition linked to by Niall above looks vaguely familiar. If I’m at a party and a cute girl asks what I do then of course I’m an astronomer; but if somebody’s trying to dominate the conversation by demonstrating how smart they are then I find it much more useful to “have a PhD in theoretical astrophysics, specialising in the statistics of light propagation in an inhomogeneous universe”. That tends to drive the conversation back to more appropriate topics (such as why that girl has now stopped talking to all of us). That line also tends to work quite well if I’m on a plane and don’t want to be drawn into an eight-hour conversation over the Atlantic . . . except the one time my seat-neighbour’s father turned out to be an astrophysics lecturer at a (very small) US university and the floodgates were opened until her sleeping tablets kicked in. Actually Bryn I joined the Cardiff astronomy group during its first year in with the Physics department. But as you say, many astronomers/astrophysicists find themselves in a department of mathematics or applied mathematics, at least in Britain. I think the US makes much more of a distinction between astronomy and astrophysics than we in the Disunited Kingdom do. I tend to fluctuate between the two when describing my “job title” to someone. I am a computer Science engineering student and I have a keen intrest in astrophysics.I wanted to take up astrophysics in my post-graduation.I would like to know ihow far that could be a feasible option for me …can you help? Hi! I can only speak for the UK. Things may be different elsewhere, but generally we would be looking for graduates in physics (or mathematics) doing a course that had some relevant astrophysics content. Typically PhD programmes here are very oversubscribed, so probably the only feasible way for you to do a doctorate in astrophysics is to take a taught masters course to convert. Examples of universities that offer such courses are Queen Mary, Sussex and UCL. You’ll need to sort out funding, too. Going by your blog, you obviously graduated in general physics and specialised in astrophysics later in the masters. I’m a high school senior and aim to pursue astrophysics as my career. So is it better to go by the more traditional way and graduate in general physics first or should I take up an undergraduate astrophysics program as I’m not too interested in studying general physics for 4 more years? In my day there was very little choice. There weren’t many (or perhaps any) undergraduate astronomy programmes. Usually students did physics with a few specialist courses in later years, like I did. Now I’d say if you’re sure you want to do astrophysics then you can do an entire degree in it, although it will include quite a lot of general physics anyway. I still don’t know what I am. I do observations but I also spent a lot of time analyzing and fit models to my data. I’ll probably just do the same thing they do in PHD comics (link at the top of comment section).